True Move operates an Airport wide WiFi service as the Bangkok airport where travelers can register and get 2 hours of internet as soon as they land in Bangkok. Usage requires registration, but it seems straight forward enough. Enter your name, ID/ Passport Number, Phone, email and country. You are then granted a user / password for 2 hours per day of free wifi. Previously the service required you to register at a desk. Now it is available just about anywhere in the airport and registration happens on your device. It is a law in Thailand for ISPs to get the users’ info for internet access. Check your remaining True Move WiFi usage here. If you need maximum speed and reliability, you can buy various usage packages from True Move, TOT and 3BB. Packages come in daily, several days and monthly. For example you can get a 1 Day unlimited WiFi package from True Move for 50 Baht. Purchase online with credit card here. 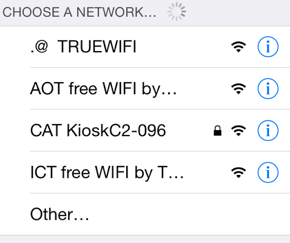 Please leave a comment below to help others on your Thailand airport wifi experience.